The Social Seducement project aims to develop the key competences and skills of adults with disadvantages, and in particular those being unemployed, to help them start up a collaborative enterprise. With Social Seducement we aim to strengthen the cooperation between education and training, work and the social economy, non-profit and voluntary sectors, in an EU dimension, Social Seducement to maximise impact on individuals and our game. We are developing a theory of change for the Social Seducement project to assess and understand the results we are achieving. We are currently updating this to incorporate latest thinking by project partners and to use the model to develop success indicators. If you'd like to know more about our theory of change and evlauation work of Social Seducement, do get in touch with our Evaluation Manager David Drabble ([email protected]). 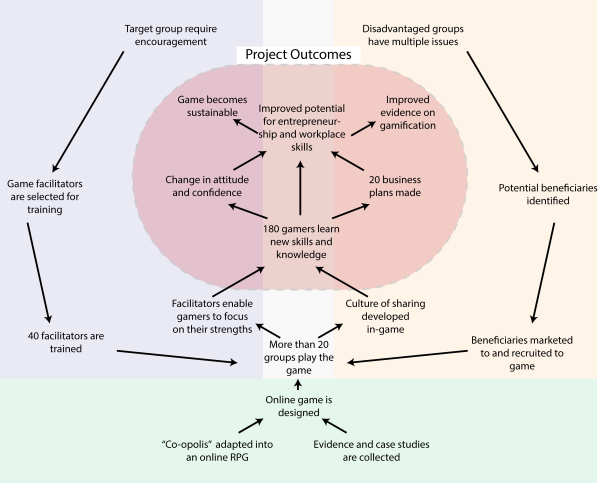 During the project we piloted the game in five EU member states: Belgium, Spain, Italy, Sweden and the UK. Watch this video to find out how the game could be used in Portugal. The Tavistock Institute of Human Relations is a social science research, consultancy and training organisation. ECOBYTE operates in the IT field in all its aspects: system administration and management, network administration, security systems management, integration and applciation development. Le Mat social entrepreneurs work in the general interest of local people and places. REVES is the only European organisiation bringing together local and regional public authorities and social economy in a stable partnership. UNIR Research works on selected scientific and humanistic fields of study with particular focus on information and communication technologies. Have you developed a serious game for social entrepreneurship training?